With twenty-six diﬀerent borders to choose from, you can make matching corners for guest towels, pillow covers, tablecloths, napkins, and even handkerchiefs. Use this simple butterﬂy lace edging and matching insertion crochet pattern to decorate garments, towels, pillow cases, curtains, table linens and more. The pattern was designed by Mrs. C.L. Hendrick in 1921. Designed by Mrs. C.H. 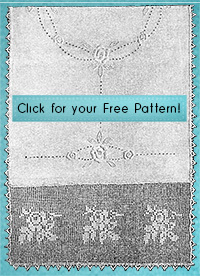 Hendrick in 1921, you can use this simple owl pattern to make a wall hanging or pillow cover, or use baby-weight yarn to make a light afghan. Designed in 1921 as a pillow cover pattern, Emma Loper made it a tribute to her crafty ancestors, who made mesh lace with thread and netting for antimacassars to keep their furniture free from hair oils. Originally designed as a pillow cover by Adaline Abington in 1925, this pattern features a VFW emblem: The Great Seal of the United States inside a badge shape surrounded by the eight rays, plus “Veterans of Foreign Wars” spelled out.